Secretary of State Rex Tillerson’s ouster on Tuesday points to a broader pattern of incredibly high turnover within Trump’s administration. A new Brookings Institution study points to President Donald Trump’s insistence on loyalty and a chaotic White House for this high rate of turnover, which is double that of former President Obama and triple that of former President Ronald Reagan. 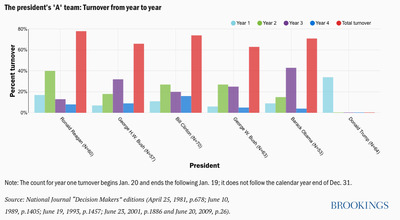 The study also stated that the number of people leaving the White House will likely only grow in Trump’s second year. The firing of Secretary of State Rex Tillerson on Tuesday, although rumoured months ago, shook Washington on Tuesday. Tillerson’s firing is the latest high-profile exit from President Donald Trump’s staff, coming on the heels of National Economic Council Director Gary Cohn’s resignation earlier this month and White House communications director Hope Hicks’s departure last month. Both Hicks and Cohn were longtime fixtures in Trump’s inner circle. 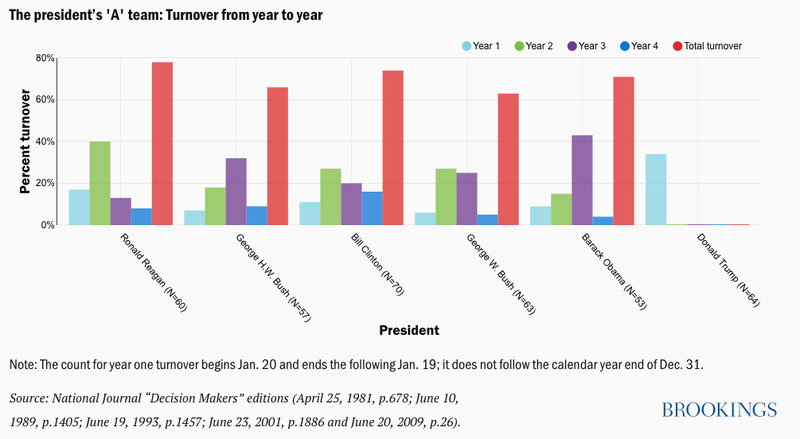 The staff turnover in Trump’s White House has certainly been record-breaking, and a new study by the Brookings Institution has the numbers to prove it. The study identified 12 positions within the administration that researchers called his “A-team” – basically Trump’s top-tier decision makers with significant influence within the administration. According to the study, a massive six of these twelve positions, or 50%, saw turnover during Trump’s first year in office, a rate that was double that of former President Ronald Reagan, the previous record holder, and more than triple that of former President Barack Obama. With the string of high-profile White House exits over the last month, this number has quickly risen in Trump’s second year. The top-tier advisers who left in Trump’s first year were former chief of staff Reince Priebus, former deputy chief of staff Katie Walsh, former press secretary Sean Spicer, former director of the Office of Public Liaison George Sifakis, former national security adviser Michael Flynn, and former deputy national security adviser KT McFarland. But the study has also identified two causes for this incredibly high number of exits that might explain why previous administration were much more stable than the White House is now – and they go right to the heart of Trump’s management strategy. Because Trump sourced many of his top staffers from his own business circle and support base, many individuals in his White House have lacked the qualifications to do their jobs, leading to lacklustre performances and the desire among many former staffers to use their brief tenures in the administration to seek private sector jobs afterward. Bannon, who went back to work at Breitbart News and a host of other private ventures after his departure, serves as a particularly salient example of this idea. 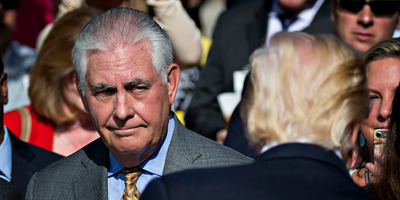 Trump told reporters on Tuesday that one reason he fired Tillerson was because he did not hold the same opinions as he did on key issues like the Iran deal, and had in the past described the former secretary of state as “too establishment,” in contrast to Trump’s outsider persona. The second factor Brookings researchers identified was the ever-present cycle of chaos within Trump’s White House. Lack of communication between officials on key speeches and policy points like the newly unveiled steel tariffs reveal that coordination between officials within the White House is remarkably weak, leading to mistakes and a poor public image that incentivizes Trump to get rid of those at fault. Brookings also stated that this creates a vicious cycle in which chaos breeds a high rate of turnover, which in turn continues to contribute to the chaos that cause it.